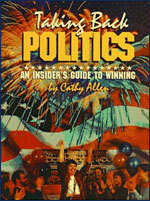 "Taking Back Politics: An Insider's Guide to Winning" is the best investment you can make if you are seeking to run for office or run someone else for elected position. This book was called "one of the most practical, professional and realistic guides ever written about campaigns — the way they should be run" by Campaign & Elections Magazine. This book is being used around the world as the standard text of how to win more efficiently. Universities such as Harvard, Yale, Georgetown, George Washington, University of Michigan, Oberlin College, Ohio State, San Francisco State and many others routinely use the book for its political science and campaign schools.